Diabetic retinopathy (DR), also known as diabetic eye disease, is one of the most common complications of diabetes mellitus and most common cause of low vision and blindness in India. It is a progressive condition with microvascular alterations that lead to retinal ischemia and macular edema. A number of recent advances have emerged in the diagnosis and management of DR. These advances could provide the means to develop major public health strategies to prevent DR and better management of diabetic retinopathy. 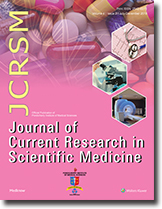 Aim: Evaluating the incidence, prevalence, and pattern of adverse drug reactions (ADRs) with the extent to which they influence cost of healthcare is often informative and useful in patients' management, policymaking and safety considerations. Methods: The patients admitted into the internal medicine wards of a university teaching hospital, South-South Nigeria over a 9-month period from December 2013 to August 2014 were prospectively recruited for the study and followed up till discharge. Results: Five hundred and seven patients were evaluated during the study, out of which 269 (53.1%) of them were males and 238 (46.9%) were females. The mean age of the study population was 48.9 ± 17.8 years (median of 46 years). ADRs had an incidence of 6.5%, while its prevalence rate was 10.1%. 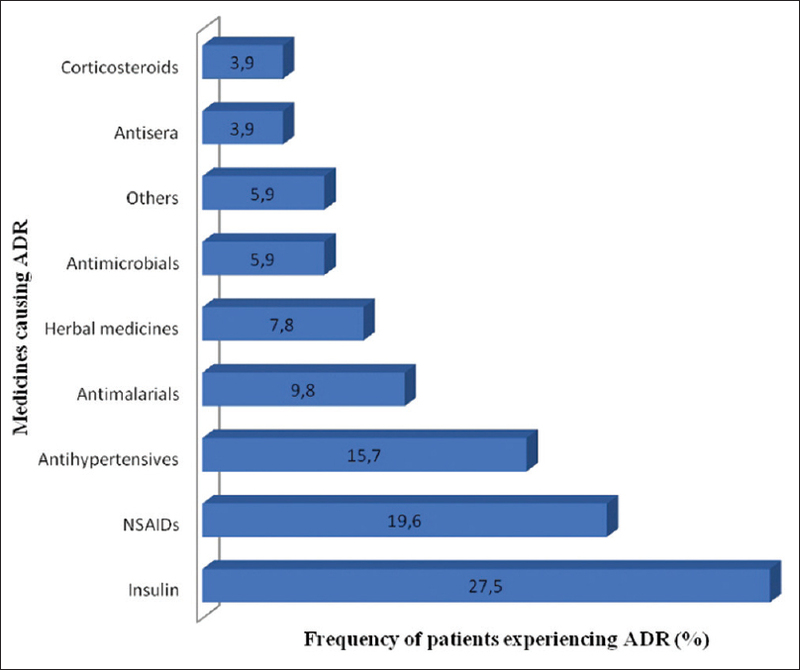 The cost of treating ADR was ₦ 161668.00 ($1243.60), equivalent to 1.9% of the total cost of all medications used by patients during admission. The case fatality rate for ADRs was 7.8%, while ADR-related mortality rate was 0.8%. The most frequently affected body systems were the central nervous system and the gastrointestinal system corresponding to insulin use (causing neuroglycopenic symptoms) and nonsteroidal anti-inflammatory drugs (NSAIDs) use (causing NSAID-induced gastroenteritis/GIT bleeding) respectively. Conclusions: The incidence and prevalence of ADRs were clinically significant among these medical inpatients. In this study, ADRs increase patients morbidity, mortality, cost of health care, and duration of hospital stay as it has been shown by previous studies. Insulin caused the highest number of ADRs, suggesting the need for individual diabetic patients to acquire and learn the appropriate regular use of glucometers. Introduction: Gram staining of smears prepared from positively flagged blood culture bottles plays a vital role because its accurate interpretation helps the clinicians to modify empirical therapy as well as to perform the direct susceptibility test, which reduces the turnaround time by 24 h to initiate pathogen-directed antimicrobial therapy. However, the interpretation of direct Gram stain from blood culture bottles has always been at risk of errors in interpreting. Aim: The present study was conducted to find the agreement between the blood culture broth Gram stain finding of four different methods (conventional, water wash, blood film, and drop and rest) of smear preparation with the culture smear Gram stain result and also to compare the quantity of charcoal and resin particles present in the Gram stained smears made from four different smear preparation methods. Method and Result: Smears were made from 500 positively flagged automated blood culture bottles using the four different methods and then compared for agreement with the culture smear Gram stain using kappa statistics and were found to be maximum for the blood film method (0.637), followed by drop and rest (0.570), water-wash (0.496), and conventional method (0.475). The 3+ grading for resin/charcoal was found in 184 (36.80%) smears, 169 (33.80%), 93 (18.60%), and 26 (5.20%) smears prepared by water-wash, conventional, drop and rest, and blood film method, respectively. The interference caused by resin/charcoal was maximum when smears were prepared by the conventional method resulting in high inaccurate interpretation. Conclusion: In this study, the agreement between direct smear preparation methods from positively flagged blood culture broth with the culture smear Gram stain was found to be maximum for the blood film method, followed by drop and rest, waterwash, and conventional method.It was also observed that the least amount of resin/charcoal was encountered when the direct smears were prepared using the blood film method.Hence, we found that the blood film method helps in interpreting the Gram stained smears from positively flagged blood culture broth more accurately compared to other methods. Background: The last few decades have witnessed the growth of diabetes mellitus which is affecting all sections of the society. Complications of diabetes and its management present a still further challenge to health care providers. Methods: A hospital-based cross-sectional study was conducted at Pondicherry Institute of Medical Sciences, India, to find out the treatment and follow-up of patients with diabetes mellitus and also to estimate ocular manifestations among the study subjects. 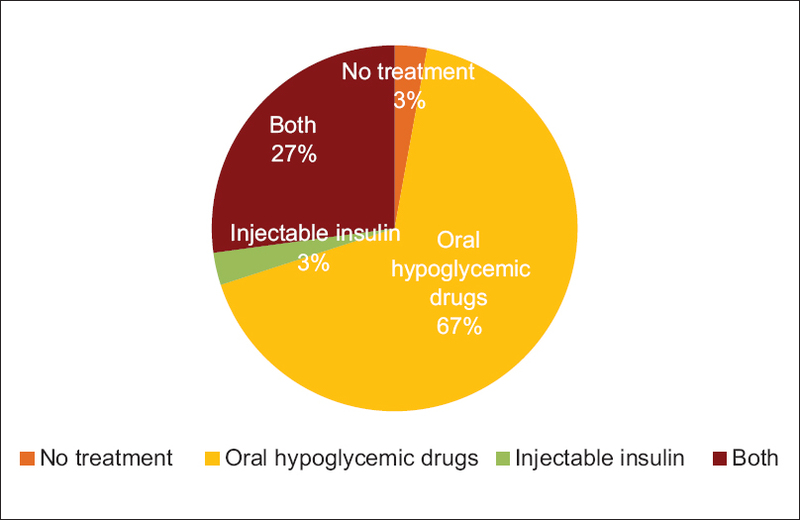 Results: Regular treatment was found among 80% while regular follow-up was seen in 55.7% of the diabetic patients. Two-thirds of the patients were on oral hypoglycemic agents only. 18.6% of the patients tested their blood glucose levels once a month. Visit to an ophthalmologist was made in the last 12 months by 32.9% of them. Ocular manifestations were present in both vegetarians 80% and non-vegetarians 76% respectively. 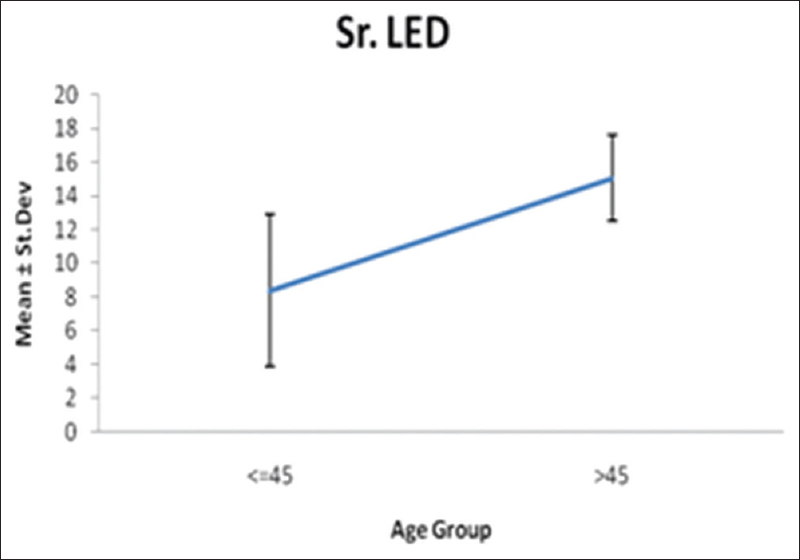 Diabetics practicing sedentary lifestyle had more ocular manifestations 87% as compared to 62.5% in those who did not exercise. Ocular manifestation was also higher among those with elevated blood glucose levels 74.4% in comparison to 61.3% among those with normal blood glucose levels. Conclusion: This study highlights the importance of regular treatment and follow-up by patients with diabetes in relation to development of ocular manifestations. Exercise in diabetes is a key factor in delaying complications such as retinopathy. 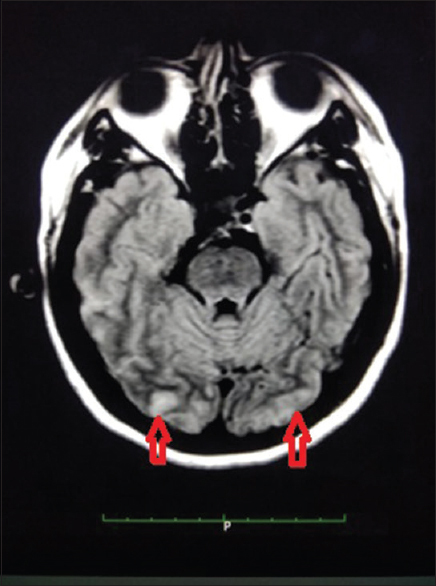 Posterior reversible encephalopathy syndrome (PRES) is a clinical and radiographical syndrome of varying etiologies. It is characterized by headache, confusion, seizures, visual loss, and raised blood pressure along with magnetic resonance imaging abnormalities. It is associated with a number of conditions such as hypertension, eclampsia, vasculitis, chemotherapeutic drugs, and postpartum state. We report the case of a 28-year-old female who developed PRES on her 8th day of postpartum along with subarachnoid hemorrhage. 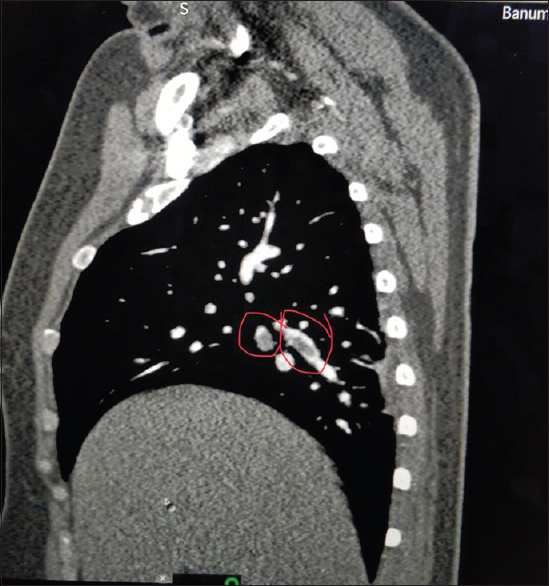 Acute pulmonary embolism (PE) is a relatively common complication after major orthopedic surgeries with a high mortality rate. We present a case of L4–L5 disc prolapse with radiculopathy posted for spinal instrumentation and fusion surgery who developed PE perioperatively. It was diagnosed initially with point-of-care echocardiography and confirmed with computed tomography pulmonary angiography. The patient was thrombolyzed with streptokinase, following which she developed bleeding from the surgical site which was managed conservatively with blood transfusions. The patient recovered well and discharged after a week. The management of PE tests the skills of the anesthetist with respect to detection and rapid hemodynamic management. Lumbricals are wormlike, intrinsic muscle of the hand. 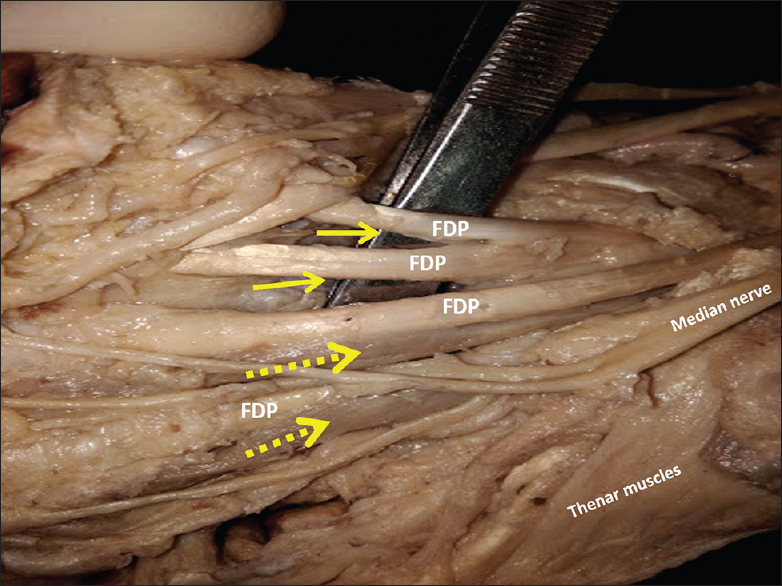 During routine dissection of a male cadaver of age approximately ranging between 50 and 55 years, the absence of third and fourth lumbricals on both the palm was observed. First and second lumbricals showed no anatomical variation. Other muscles of hypothenar eminence supplied by deep branch of ulnar nerve which also supplies the third and fourth lumbricals were normal. Lumbricals are principle extensors of interphalangeal joint, and its role in flexion of metacarpophalangeal joint is meager. Variability in the presence of medial two lumbricals has evolutionary correlation and also shows its minimal role in the extension of interphalangeal joint of its respective digits. Henceforth, knowledge of absence of lumbricals is crucial for surgeons while planning for hand surgery. Perioperative myocardial infarction (PMI) in patients without a prior history of coronary artery disease is quite rare. Diagnosing PMI is also quite challenging because of a myriad of events mimicking MI during the perioperative period. we are reporting of PMI leading to cardiac arrest which was successfully resuscitated with the help of a multidisciplinary team. Cardiologist opinion was obtained, and angiogram was done which showed block in left anterior descending artery for which he was stented with drug-eluting stent and discharged a week after with full neurological recovery. The mechanism for triggering PMI in our case is quite inconclusive.